Join me as I make genetic discoveries about the Palestinian Christian population through DNA testing of my paternal family members. Follow along as I post results and interpretations of various DNA tests conducted on my Palestinian Christian family members. For a condensed version, read the Summary page for key findings. For more in-depth review, the other pages & blog posts will offer detailed and specific information. Use the labels to find posts relating to the Pages above or family surnames. Feel free to contact me at holylanddna@gmail.com. 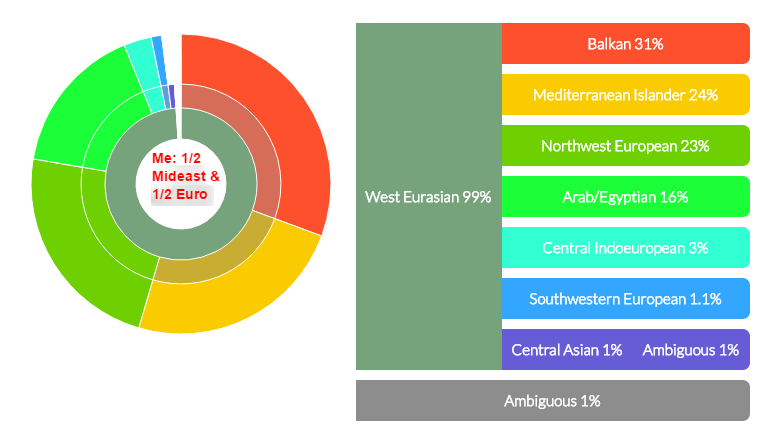 My Heritage DNA is offering free transfers of raw data from 23andme, FTDNA, or AncestryDNA to their site for ethnicity analysis and DNA matches. Seeing nothing to lose, I thought I'd give it a try. The results are interesting. See below my paternal grandfather. What really stands out to me is the very high amount of Mizrahi Jewish. 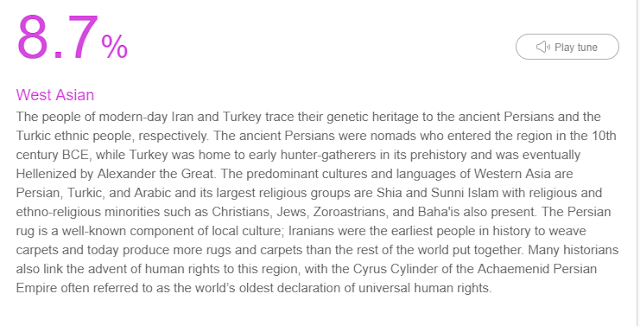 West Asian is the same as Caucasus. Middle Eastern here is the Levant but also parts of Arabia. The Italian score is high, but my grandfather consistently gets high Italian on all the tests, even comparatively with other Palestinian Christians. The North Africa here could be Egyptian or Berber. So, even more surprising because she not only gets Mizrahi, but 8.8% Ashkenazi! I don't know how it is possible for her to have actual Ashkenazi ancestry seeing as how it would be too close in time to make sense. I am unaware of any Jews in the family beyond those in ancient times pre-Christianity. Of course, anything is possible, and this might very well be the case. However, with strict marriage laws between religions, I feel it was not likely. Another thing to note is that My Heritage is an Israeli start up company. It might explain why their reference populations include Sephardic, Mizrahi, and Ashkenazi Jews. The same is true at FTDNA where my grandfather gets 20+% Sephardic Jewish ancestry (they sometimes lump Mizrahi into Sephardic which must be the case there). I wonder if they are less conservative in assigning Jewish ancestry or have different algorithms. The DNA matches are not available yet and are still processing. I would be curious to see other results from this company from Middle Eastern people. Please share and comment if you have tried the free transfer and let me know what you think of it! Discover more of your story with myOrigins! We’re excited to announce the latest updates to myOrigins, our advanced and popular mapping tool that reveals your ethnic and geographic ancestry. To experience the latest enhancements, which include new, detailed descriptions of each population cluster, sign in to your account and from your myFTDNA dashboard click on the myOrigins button. I was eager to check it out and see how it compared to the previous results. Interesting observations- Asia Minor once again is the highest %, Sephardic was a big surprise coming in at a huge 22%, Southeast Europe trumps Eastern & Western Middle East. Those Caucasus genes are strong! And probably why my father got Georgians as his closest reference population group in Geno 2.0 over Lebanese. I'm puzzled by the high Sephardic score! Someone recently mentioned that the Mediterranean is just a big lake and people intermarried from all around it, on both sides of the pond. Looking at this map, it makes a lot of sense. His comments: comparing him to other populations, just based on his DNA, his looks: Iraqi_Jew + Libyan_Jew + Samaritian + Syrian_Jew. Here results are more in line with what I would expect. Still highest with Asia Minor, but West Middle East is 2x as much as East Middle East. There is some Ashkenazi in the mix, but much less Sephardic. Southeast European is high on both results. "DNA Land is a place where you can learn more about your genome while enabling scientists to make new genetic discoveries for the benefit of humanity. Our goal is to help members to interpret their data and to enable their contribution to research. We are geneticists from Columbia University and the New York Genome Center who work independently of these companies (major DNA testing companies). We will compare your DNA with reference data from different populations to see where in the world your ancestors might have lived. With that in mind you will want to read the FAQ for information about privacy and usage before uploading your raw data. The process is similar to gedmatch and results are usually available in 24 hours. This sample above is from my grandfather with some known paternal ancestry from Lebanon, but mostly Palestinian on both sides. Arab/Egyptian- this includes Egyptian, Palestinian, Bedouin, Israel, Jordanian, Syrian, Saudi, Yemen, and Yemenite Jew. So, quite broad in that it includes some Levantine and also Mizrahi Jews in this category. I wish it broke it down further. Thoughts on this sample's results: it basically says my grandfather is 42% Arab (with some Levantine & Mizrahi thrown in the mix) and 37% Southern European and 21% Caucasus. I've never seen it quite laid out this way before. The Balkan is higher on this than any other calculator. 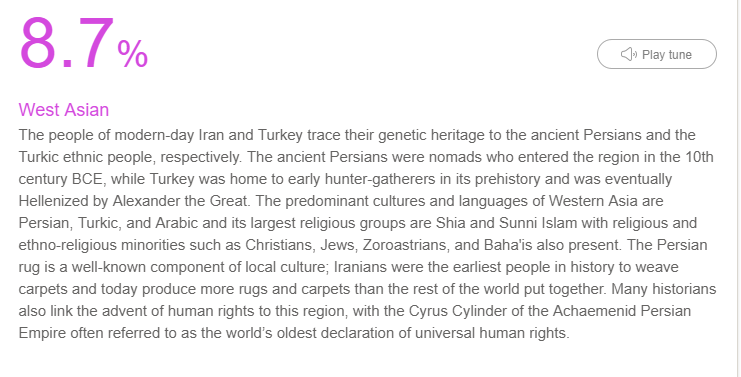 The Caucasus element is lower here, but maybe because Levantine is typically clumped into Caucasus on other tests. Not sure how accurate this is, but it definitely points to a strong southern Euro- Greek/Italian influence. This is my grandmother's sample and she is 100% Palestinian as far back as we know. She shows up as a second cousin with my grandfather across all tests, and they share quite a bit of DNA. The differences in their results here are interesting because technically you would think they would be more similar. Ashkenazi/Levantine- this is a category that my grandfather did not even get, which is very surprising. His Med. Islander showed up on it's own and not under the Ashkenazi/Levantine header. Surprisingly, she gets even more Med. Islander at 24%, definitely the highest I have ever seen her receive in that category. 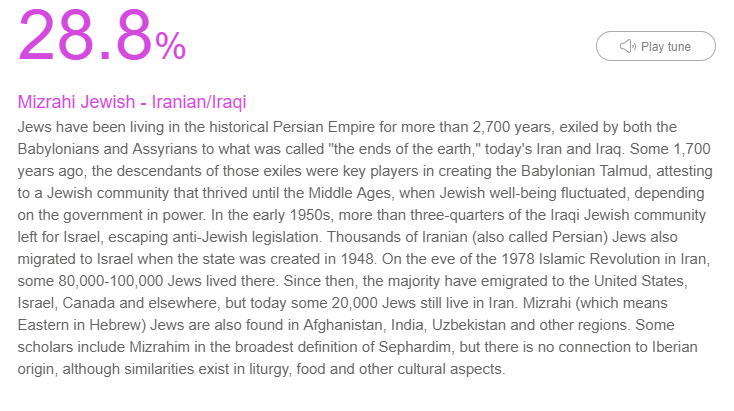 Ashkenazi at 7% seems about right for the tests that go back closer to 1000 years. Central IndoEuro- Caucasus element is about the same as my grandfather's. Sardinian- new one here, I have seen this pop up on certain gedmatch calculators. She doesn't have the Southern Euro (mainland Italian) & Balkan that my grandfather has, whereas he is not showing the Ashkenazi. Maybe this shows the differences between his Lebanese side - which would give him more of that Mediterranean influence. This is my father's sample, child of the two samples above. He got nearly all of his parents' combined Mediterranean Islander with a whopping 37%! This combined with Ashkenazi displaces Arab/Egyptian for the top component in his DNA. He shows less Central Indoeuropean, no Balkan or Southern Euro and no Sardinian. He matches his mother more closely in his results. Still, seems surprising that 20% Southern Euro genes would get lost from his father (?). And here is where things get a bit more skewed. These are my results and I can say they are not very accurate. My mother is entirely NW Euro and my father is 100% Palestinian. Where does the 31% Balkan come from? And the 24% Med. Islander? If we assume the 24% Med. 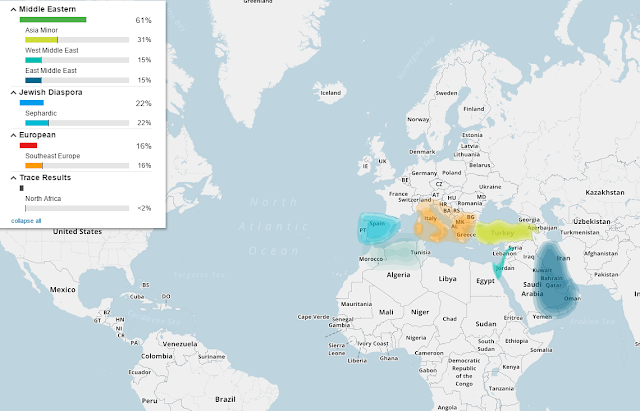 Islander, 16% Arab/Egyptian, and 3% Central Indoeuropean comes from my father (43%), at least 7% of the Balkan has to come from my paternal side as well. It's impossible to skip a generation - I can only inherit from my grandfather, what my father also inherited. If my father did not inherit any Balkan, then I cannot either. So, it's puzzling and inaccurate. My mother does not have any known Balkan ancestry and even if she had a trace, this does not account for 31% of my dna. If I were an adoptee, I would come away from this test thinking I was some kind of Greek/Italian with one NW Euro grandparent. Dna.land is free to use and I suggest it if you have the time. You only get one results, not multiple tools to play with like gedmatch. Overall, I would say it is not nearly as accurate as other tools available, but still interesting to look at. If you have used this site, I'd be curious to hear what you think of your results! I have a number of updates to share with you and hope to give more details soon. 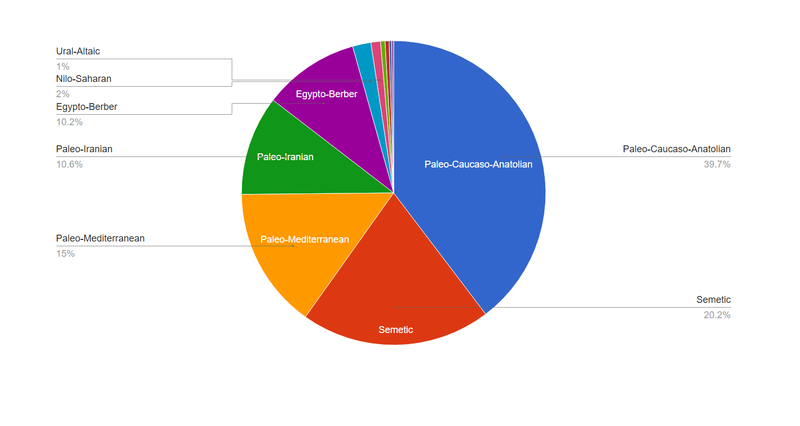 Big Y results for a Beit Sahour native have come in and show 29 unique snps. My great-uncle's results also just came in and I have yet to fully review them, but will post more on that soon. In the meantime, thank you to those who have contacted me through this blog. There is a good number of Palestinian people who are interested in their ancient roots and I am glad to know I'm not alone! I appreciate the interest, support, and participation. Feel free to ask me any questions about your testing or what we have learned so far, and I will do my best to answer. It might take me a few days to respond, but I promise I will get back to you. Also, please be sure that holylanddna@gmail.com is on your safe list. A few times people have not been getting my replies. Thank you! 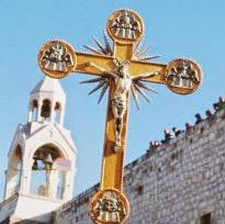 You may be familiar with some of the oral histories of the clans of Bethlehem. DNA testing can be useful in confirming or discounting some of these stories. Recently, I came into contact with a Dabdoub DNA match at 23andme. He is the third male DNA match with this last name that falls into our DNA relatives list. The Dabdoub family history is a fascinating read and it begins with the founding of the Tarajmeh clan: (information taken from dabdoub.ps). And so the two brothers achieved their purpose and became residents ofBethlehem working as translators as they had once wished. In the beginning, the Bethlehemites used to address these two foreign strangers (probably because their names were too difficult to pronounce at the time) with their craft or trade, the translators: al tarajmeh. During their stay in the town, it was inevitable that the two tarajmeh would come in contact with the locals of Bethlehem, and so each one apparently wooed and married a talhamiyeh, from which they must have had some children… and these children must have also been the sons of tarajmeh, hence tarajmeh themselves. And so the stories goes that these two brothers lived happily (but not ever after) with their wives and children under one same roof in some part of the old town of Bethlehem. Some years later, the two tarajmeh brothers had a row and decided that they should live separately. And so they built a second upper floor to the one-floor house they used to reside in. Each of the brothers then moved into each of the floors having a upper and a lower turjmani. The children of the two brothers then got married and bore more tarajmehwho bore even more of the same. For generations, the offspring belonged and had loyalty either to the upper or to the lower family. With time, the Tarajmeh became obviously split into the upper and the lower hara (neighborhood). And so, each of these two neighborhoods had their own families. As I continue to work on the results of my grandparents, great-uncle, and father, it becomes clear that we need more DNA samples of the natives of Beit Sahour, in particular, but Palestinian Christians in general. The only way to confirm our oral histories is by DNA and so far they look accurate! DNA testing also shows us how families are related to each other without the help of female maiden names. We can find out who our ancient paternal and maternal ancestors were and where they came from. It really is a fascinating study about the people of Palestine and their long-standing history in the land. I just updated the Participate! page which outlines the different tests and explains what we are looking for. If you have any interest in helping the project, please contact me for more information. I took advantage of a recent sale at AncestryDNA to get my father tested. My expectations were low because this is a US only test and I figured the number of matches he would have there would be very small. I was pleasantly surprised that he received 25 pages of matches (compared to my mother's 203 pages!). His top match is a 3rd cousin from the Rishmawi family in Honduras. But, I was also impressed with how they calculated the ethnicity results, see below.